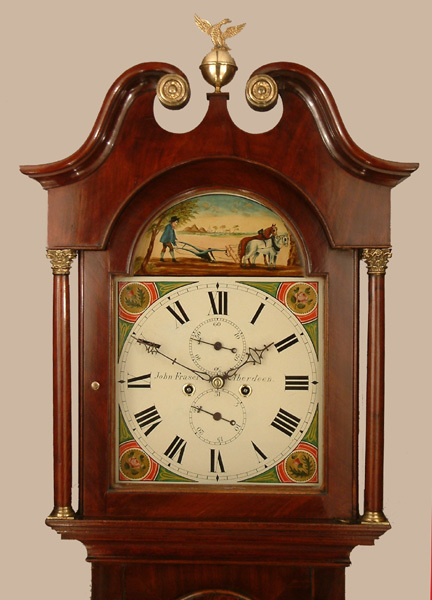 John Fraser of Aberdeen Longcase Mahogany Circa 1840 - Height 83.8in. 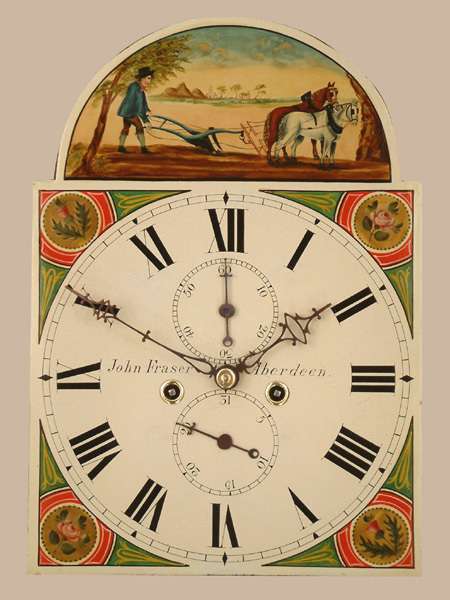 This Longcase Mahogany Archive's Maker - John Fraser of Aberdeen. Recorded, a single date, 1846 at 166, Union St., Aberdeen. A really pretty, long door mahogany case with swan neck pediment, Corinthian capitals to turned hood columns, side windows to hood, "split turned" trunk half columns, rosewood crossbanding to choice mahogany veneers all on shallow bracket feet.The dome top trunk door and overall case design typical of the Aberdeen area. 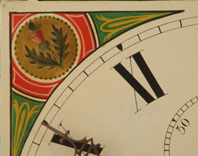 12" breakarch painted dial with colourful ploughing scene to arch and thistles/roses to corner spandrels. Subsidiary seconds and date dials. The dial centre signed John Fraser Aberdeen. Blued cut steel hands. Good quality, 8 day, 4 pillar movement with hourly ( rack ) striking. John Fraser of Aberdeen. Recorded, a single date, 1846 at 166, Union St., Aberdeen. 83.8" ( 213 cms. ) 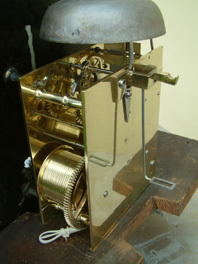 or 80.7" ( 205 cms. ) ex.finial.